NMM 10474. Electric upright bass guitar by Gibson, Inc., Kalamazoo, ca. 1938. In the 1930s, Gibson, Inc. realized that the unexpected success of the Electro String Instrument Company's "frying pan"—an aluminum electric Hawaiian guitar—could not be ignored. Gibson introduced a competing electric Hawaiian guitar with a metal body in 1935, though it soon changed the body to a wooden one with sunburst finish. 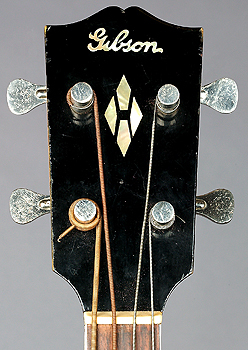 In 1936, Gibson introduced the matching ES-150 electric Spanish guitar and the EM-150 electric mandolin. It even made a few dozen electric plectrum and tenor banjos. The NMM's bass is one of five or more electric basses made by Gibson in the late 1930s, but these instruments were never mass produced. The hollow-bodied instrument has no sound holes, only an early blade pickup with hexagonal housing, often called the "Charlie Christian" pickup after the jazz artist who was an early adopter of Gibson's ES-150 electric arch-top guitar. 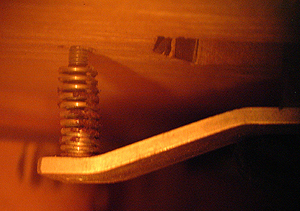 Although the instrument appears surprisingly modern for its age, it has a long string length suited to upright rather than seated playing, and it is fitted with an extendable endpin (short scaling and guitar-style playing were hallmarks of Fender's revolutionary Precision Bass, the first commercially successful electric bass, introduced in 1951). 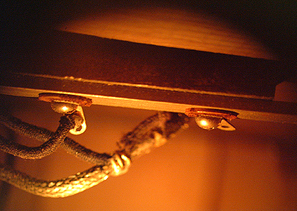 It also has a unique, pedal-operated, felt string mute that presumably would dampen the strings enough to imitate the sound of an acoustic bass. The instrument features a beautifully figured maple body with shaded sunburst lacquer and a mando-bass-type neck with flush frets. 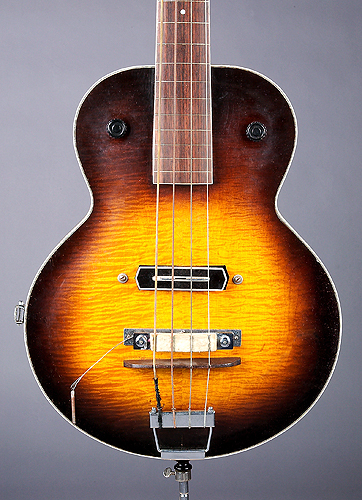 Another Gibson electric bass was purchased second-hand from the Honolulu Conservatory of Music in 1940 and was used by Mrs. Theodore E. Snow, who as a teenager performed with her family's musical ensemble, the Hawaiian-themed Tropical Islanders. 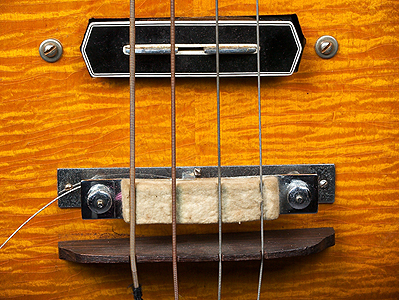 This bass, now at the Experience Music Project in Seattle, has a larger guitar-shaped body and no string mute. Gibson did not bring any electric basses to the mass market until the violin-shaped Gibson Electric Bass (EB-1) in 1953. Lit. : George Gruhn, "Gibson Upright Electric Bass," Vintage Guitar Classics (June 1997), pp. 12-16. Willie G. Moseley, "Likely the First! 1938 Gibson Electric Bass," Vintage Guitar Vol. 18, No. 3 (January 2004), p. 32. Arian Sheets, "Early Rumblings for an Electric Bass; NMM Acquires Gibson's Prototype Electric Bass Guitar, ca. 1938," National Music Museum Newsletter, Vol. 32, No. 2 (May 2005), pp. 4-5. "Enthusiastic About Electric Instruments," Cooperative Connections (February 2009), p. 15.